Posted on May 23, 2018 by Kelly M.
The Spring CSA is in full swing this week, as our shareholders enjoy a plethora of crisp greens and hearty root vegetables. 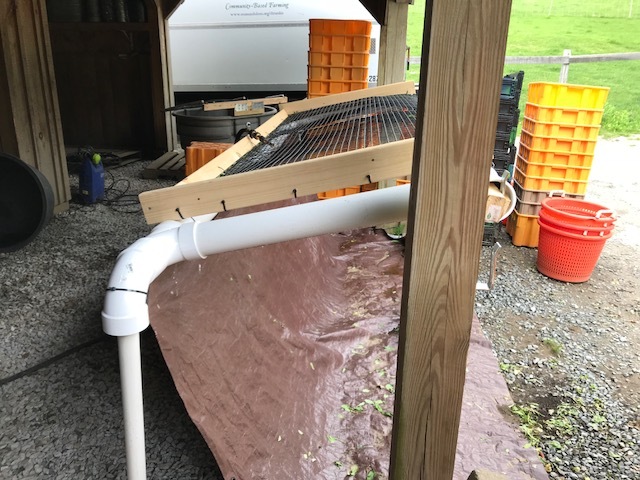 The rain that fell this past Saturday and Sunday will help germinate the seventh round of greens, seeded weekly, and the fourth round of beets and spinach, seeded every two weeks. The potatoes we planted on May 3rd are up, and today we’ll drag the rake over that acre for the third time to stir up the soil and kill small weeds. We’re beginning to harvest head lettuce, dinosaur kale, spring turnips, scallions and dandelion greens. And we’re looking forward to the start of strawberry and pea season, still several weeks away. As the harvests get bigger and longer, part-time fieldworkers will be joining the team this week. We’ll have an updated team picture to share next time. On Thursday of last week, four volunteers from the tech company Cisco Systems helped us transplant the first cauliflower and cabbage of the year and the second round of celery. In the middle of the job, the tractor tire went flat, so the volunteers switched gears by jumping into the garlic patch to help pull weeds there. We normally don’t have to weed in the garlic patch since we mulch it with straw, but unfortunately, this batch of straw has lots of seed in it. Thankfully, it’s just cover crop seed, and the “weeds” pull up fairly easily. Earlier that day, Food and Farm Educator Emma Scudder led several groups of Nashua seventh graders in that weeding job. Emma received help organizing the students from amazing Crops Interns Hannah Zar and Lilly Bomberg—both high school seniors. Thanks to all for their important and much needed help! Teachers, there is more work to do battling weeds in the garlic patch, so please let us know if you need a chore or volunteer hours for your classes or groups. 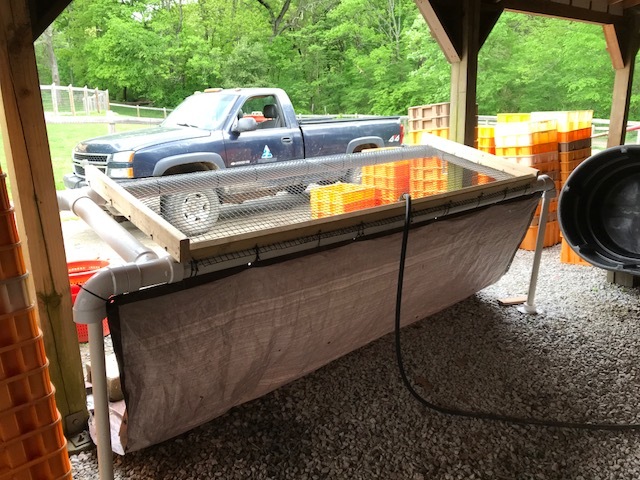 In the wash station, thanks to volunteer Fred Costanza, we have a new screen for cleaning bunched roots (pictured below). It’s a great design because it makes use of the existing structure for support, has no center post on which to bump your feet and knees, the majority of the materials are plastic and metal to better withstand being wet from rinsing, and the height of the screen can be adjusted to match the size of the person spraying the roots. The tarp keeps the sprayer’s legs dry. Thanks Fred! Spring CSA shareholders will be picking up their share today at the farmstand 12-6 pm. Registration is open for our Summer CSA, where you’ll enjoy the height of growing season and a large variety of fresh fruits and vegetables grown at Drumlin Farm. This entry was posted in Farming and tagged crops, crops update, csa on May 23, 2018 by Kelly M..